Cook the ribs in a pot with water with the bacon for about 20 minutes. In another pot, cook the chicken for 50 minutes. Once they're fully cooked, remove the meats from the pot. In a large saucepan, fry the garlic and onion, and season with the annatto seeds. Once the ingredients are well mixed, add the peas, rice, and corn flour. Sear the plantain leaves on the stove. This requires a high flame to pass over both sides of the leaves to release the flavor. Once the leaves are seared, join two of them and begin to fill. Grease them and add approximately 4 tablespoons of the dough, along with the carrots, boiled egg, pork and bacon. Spread well over the leaf. Cover with two more tablespoons of dough. When you're ready to close your tamal, take the corners and fold them in tightly. Fasten tightly using the twine, ensuring that they are securely wrapped. In a large and deep pot, heat the broth from the meat and chicken, and place the tamales within to boil. Ideally, you want the tamales to be completely submerged in the water (you can add more water if necessary). Cover the pot and let cook for 4 hours at low heat. When ready, take the wrapping off very carefully so as not to burn yourself with the steam. Serve hot. The best thing to do is prepare enough tamales to be able to freeze some and enjoy at a later date. You may also want to prepare them the day before you plan on serving them, because of the cooking time. I also recommend seasoning the meat for a few days. Serve with a nice cup of hot chocolate. You can wrap the tamales in aluminum foil before boiling to make sure water doesn't get through. Colombian tamales are different from others you may be familiar with in that they are made with corn flour and contain different ingredients. They also get a delicious infusion of taste from the leaves used to wrap them. 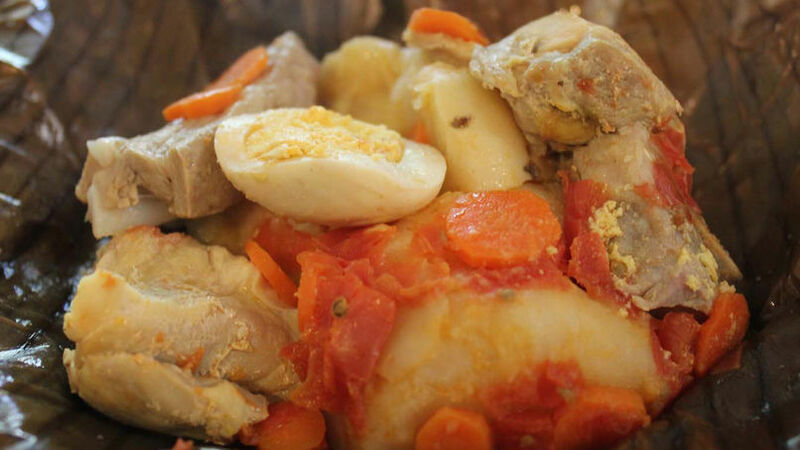 This dish is very typical during the holidays such as novenas and Christmas Eve dinner. It's customary to prepare this dish in large amounts, given the amount of ingredients and cooking time. Here's my recipe for a Tolima-style tamal.